Beans are the second most popular vegetable grown in home gardens, according to Utah State University Extension. Both bush and pole beans should be harvested before the pods are fully mature, while they are still tender. Beans are ready to harvest one to two weeks after flowering. Pick beans regularly to keep the plants producing as long as possible. Pole beans are vining plants that wind themselves around their support structure. Under ideal growing conditions, pole beans can grow to a height of 10 feet or more before being killed by frost in autumn. 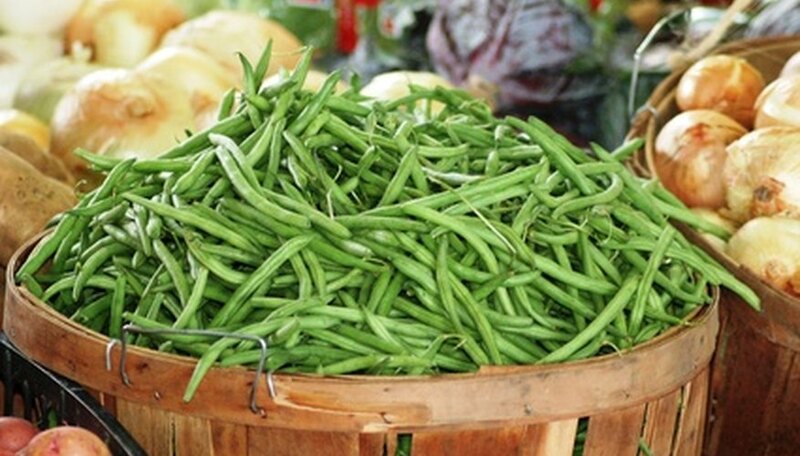 Bush beans grow on 18-to-24-inch plants. Commercial growers plant bush bean varieties because they are easier to harvest than pole varieties. Depending on the variety, pole beans take approximately 73 days to reach maturity. Bush beans can mature in about 50 days for early-maturing varieties. Although they take longer to reach maturity, pole beans continue to produce beans for several weeks, often through the remainder of the growing season until killed by frost in autumn. Bush beans, on the other hand, produce their crop all at once over approximately two weeks. This is especially advantageous for commercial growers, who uproot the entire plants when harvesting bush beans. Due to their long-standing popularity with commercial growers and increasing popularity with home gardeners, bush beans are available in many different varieties. Hybridizers have developed bush bean varieties tolerant of various climactic conditions, pests and diseases, as well as soil types. Pole beans are available in several different open-pollinated, heirloom varieties, but hybridizers have also developed varieties with similar attributes as hybrid bush bean varieties. Bush beans may be more widely grown than pole beans, but overall pole bean varieties have a much better taste than bush bean varieties. Many gardeners grow bush beans to can and freeze for winter use but plant pole beans for fresh eating during summer because of their superior taste.